Purpose: To investigate the effects of two different forms of sodium ascorbate (solution and gel) as antioxidant surface treatments in reversing the compromised bond strength after vital in-office tooth bleaching with 38% hydrogen peroxide. Materials and Methods: The study included 25 natural teeth (premolars). The crown of each tooth was sectioned in the mesio-distal direction to use both the buccal and lingual enamel surfaces for the bonding procedures. Then, the samples were randomly divided into 5 groups (n=10), according to different treatment options of bleaching and bonding. The specimens were then subjected to a shear bond strength test using a universal testing machine. The modes of bond failure were determined using a stereomicroscope and a digital camera. Results: Bleached enamel immersed in saliva for two weeks before bonding and nonbleached enamel surfaces showed significantly higher bond strengths to composite resin than did enamel surfaces bonded immediately after bleaching without an antioxidant surface treatment (P=.000). There was no significant difference between delaying bonding for two weeks after bleaching and bonding without any bleaching procedure (P=.999). A resin composite bonded to bleached enamel surfaces that were treated with both antioxidants in the different solution forms showed a significantly higher shear bond strength than did a resin composite bonded immediately after bleaching (P=.000). There was no significant difference between the use of sodium ascorbate solution or gel in the shear bond strength (P=.999). It was noted that most the adhesive failures in this study were at the adhesive/resin interface Conclusion: Bonding resin composite immediately after enamel bleaching with 38% hydrogen peroxide reduced the shear bond strength. Both the gel and solution forms of 10% sodium ascorbate can reverse the reduced bond strength after in-office enamel bleaching. Vital tooth bleaching is a safe and commonly accepted treatment for tooth discoloration [1-3]. It has been used as a noninvasive method to treat tooth discoloration. Tooth discoloration has varied and complex causes. It is usually classified as being either intrinsic or extrinsic in nature. The causes of intrinsic discoloration include congenital defects, progressive tooth aging, history of trauma, and the ingestion of medications such as Tetracycline in early childhood or during pregnancy. Intrinsic discoloration is also caused by endodontic therapy, discolored old restorations, dental caries, and dental fluorosis. On the other hand, extrinsic staining may be attributed to dietary products, smoking or dental plaque . The severity and intensity of discoloration varies by case . A third category of “stain internalization” has been described to include those circumstances where extrinsic stain enters the tooth through defects in the tooth structure . A number of methods for tooth whitening using different whitening agents, concentrations, application modes, and activation methods have been described in the literature [7-10]. However, the three fundamental vital bleaching approaches are dentistsupervised night guard bleaching, in-office or power bleaching, and bleaching with over-the-counter products . Home bleaching typically uses a low concentration of the whitening agent (10-20% carbamide peroxide) applied to the teeth via a custom fabricated mouth guard worn for at least 2 weeks [8,9]. In-office bleaching generally uses a high concentration of the whitening agent (25-38% hydrogen peroxide) for a number of visits. The whitening gel is applied to the teeth after protection of the soft tissues, and the peroxide is further activated by heat or light [7,9]. Over-the-counter products contain a low concentration of the whitening agent (3-6% hydrogen peroxide), which is self-applied to the teeth via gum shields, strips, or paint-on product formulations. These require twice-per-day application for up to 2 weeks . The mechanism of tooth whitening by oxidizing materials is not fully understood . According to the literature, teeth are whitened with materials such as hydrogen peroxide and carbamide peroxide via the initial diffusion through the enamel into the dentin [13,14]. Hydrogen peroxide acts as a strong oxidizing agent through the formation of free radicals, reactive oxygen molecules and hydrogen peroxide anions . They form a loose association with urea to produce urea peroxide (carbamide peroxide), which is easily broken down in the presence of water to release free radicals that 3 penetrate through the enamel pores and into the dentin, producing the bleaching effect. Urea can theoretically be further decomposed to carbon dioxide and ammonia, which elevates the pH to facilitate the bleaching procedure further . As dental bleaching has become increasingly popular, dentists should be aware of the consequences of bleaching agents and their interactions with additional esthetic restorations, such as adhesive restorations [8,9,10,16,17]. The reduction in the bond strength of composite resin on bleached enamel surfaces has been reported in previous studies [18-23]. This reduction in bond strength might be due to the presence of residual peroxide. These particles may interfere with the resin attachment and inhibit the polymerization of resin monomers [24,25]. If the bleached enamel surfaces are restored after a period of time, composite resins are able to achieve their inherent and intended bond strength [26,27]. The delayed bonding period after vital tooth bleaching has been reported to vary from one day to four weeks [26-29]. Some techniques have been suggested to reverse the compromised bond strength of composite resin to the bleached enamel surface. Removal of a superficial layer of enamel was proposed by Cvitko et al. Application of an adhesive containing organic solvents was suggested by Sung et al. . Barghi and Godwin used alcohol before restoration to treat bleached enamel . Many antioxidants showed effectiveness in reversing the compromise bond strength after bleaching, such as 10% sodium ascorbate , 10% green tea gel , and α-tocopherol . Kimyai et al. tested the effect of hydrogel and the solution form of sodium ascorbate on the enamel-resin composite shear bond strength after home bleaching with 10% carbamide peroxide. They found that both gel and solution can significantly increase the bond strength of the resin composite to enamel after bleaching . Many studies have confirmed the effectiveness of 10% sodium ascorbate in reversing the compromised bond strength of enamel previously bleached with 10% carbamide peroxide bonded to resin composite [19,27,34]. To date, the effect of the same percentage of sodium ascorbate and the two forms (solution and gel) has not been tested on in-office bleached enamel. Therefore, the purpose of this study is to investigate the effect of the two different forms of sodium ascorbate (solution and gel) as an antioxidant 4 surface treatment in reversing the compromised bond strength after vital inoffice tooth bleaching with 38% hydrogen peroxide. A pilot study was carried out to investigate the selected materials used in this study and the reliability of the test design. This study used 25 natural teeth (premolars) extracted for orthodontic reasons. The teeth were free of caries, cracks, abrasion facets, fluorosis, and damage from extraction. After extraction, all teeth were cleaned and stored in distilled water with 0.05% thymol solution until mounting to prevent bacterial growth. The roots of all teeth were removed approximately 2 mm below the cemento-enamel junction using a slow-speed diamond saw (Isomet 2000, Buehler, Lake Buff, Illinois, USA) under a water-coolant spray. The crown of each tooth was then sectioned in the mesio-distal direction to use both the buccal and lingual enamel surfaces for the bonding procedures. The roots of all teeth were removed approximately 2 mm below the cemento-enamel junction using a slow-speed diamond saw (Isomet 2000, Buehler, Lake Buff, Illinois, USA) under a water-coolant spray. The crown of each tooth was then sectioned in the mesio-distal direction to use both the buccal and lingual enamel surfaces for the bonding procedures. diameter of 20 mm and height of 30 mm, which were fabricated and used for mounting the teeth. Each sectioned specimen, either a buccal or lingual surface, was embedded in the acrylic resin while it was soft with the buccal (or lingual) surface facing upward. The embedded enamel surfaces were grounded and polished using 240-, 400-, and 600-grit silicon carbide paper (Buehler, Lake Bluff, Illinois, USA) mounted in Automata Machine (Jeanwirtz, GMBH, West Germany). The process started with the courser 240-grit paper and ended with the finer 600-grit paper to create a uniform, flat, polished surface that was flush with the acrylic resin. This step also aids in grinding the enamel surface to be ready for the bonding procedure [32,35]. The samples were inspected with a light microscope (Stereozoom 5, Bausch & Lomb, USA) to ensure that the enamel surface was intact and that no dentin was exposed. Then, the samples were randomly divided into 5 groups (n=10), with each group treated as shown in (Table 1). Sodium ascorbate solution was prepared as described by Sasaki et al in 2009, as shown in (Table 2) . Sodium ascorbate gel was prepared by heating 100ml of the prepared 10% sodium ascorbate solution, and approximately 1 g of gelatin powder was then added with stirring for 2 minutes to allow the solution to thicken. After that, the solution was cooled in a refrigerator at 5°C for 1 hour . The pH was adjusted using a pH meter (JENWAY 3020 pH meter). All materials were calibrated prior to use. Table 2: Antioxidants Surface Treatment According to Sasaki and Kimyai [32,33]. All materials were obtained from Sigma-Aldrich® Chemical Company/England. A faculty colleague in the chemistry department, King Saud University, prepared the antioxidant solution and gel used in this study. Enamel specimens in groups 2-5 were bleached using the in-office bleaching material Opalescence® Xtra® Boost™ (38% Hydrogen Peroxide) chemically activate whitening gel (Ultra Dent) according to the manufacturer’s instructions. After the bleaching procedure, all specimens were washed with distilled water and placed in a labeled container with fresh distilled water. After bleaching, all specimens in test groups 4 and 5 were subjected to surface treatment with antioxidant solutions before bonding. The assigned antioxidant solution (Group 4) was applied to the surface of each enamel specimen for 10 minutes according to the methodology of Turkun et al. . The sodium ascorbate gel (Group 5) was applied on the enamel surface for 3 hours according to the methodology of Kimyai et al. .
A customized silicon mold with a thickness of 2 mm was fabricated to be used in the composite bonding procedure. A 3 mm circular hole was made in the center of this mold. The mold was placed in the center area of the enamel surface. The demarcated enamel surface was etched with 37% phosphoric acid (etching gel, Ivoclar, Schaan, Liechtenstein) for 30 seconds, washed and dried . The total-etch adhesive system (Syntac®, IvoclarVivadent, Schaan, Liechtenstein) was applied according to manufacturer’s instructions. Increments of resin composite (Filtek™ Z250 Universal Restorative Composite, 3M™ESPE™) were applied to the enamel surface and packed gently with a plastic instrument. A thin glass coverslip with a thickness of 1 mm was placed on top of the composite to stabilize it with a static constant load (weight of 200 grams) on each side of the coverslip [35,38]. The composite was light cured vertically for 40 seconds with a previously calibrated LED light curing device (Elipar™ S10 Curing Light, 3 M™ ESPE™) according to the manufacturer’s instructions, the glass coverslip and mold were then gently removed, and the sample was cured again for 20 seconds . After bonding, the samples were stored in distilled water at 37°C for at least 24 hours and then subjected to 1000 cycles in a thermocycling apparatus (Thermocycler THE1100/1200, SD Mechatronik) between baths of 5 and 55°C with a dwell time of 30 seconds [35,38]. The specimens in groups 1 and 3 were immersed in 250 ml of artificial saliva at 37°C for two weeks. Artificial saliva was prepared as described by Cavalli et al . The specimens were subjected to a shear bond strength test using a universal testing machine (Instron 5965, England) with a load cell of 10 KN. A knife-edged rod with a width of 0.5 mm was applied at the interface of the resin composite disc with the enamel at a crosshead speed of 0.5 mm/min. The fracture sites along the enamel-composite disc interface were observed under a stereomicroscope (Nikon Stereomicroscope 100 m Microscope, SMZ 1000, SMZ800, Swift, CA, USA) and with a digital camera (Nikon digital camera DXM 1200F) to determine the modes of bond failure. Fracture modes were classified as adhesive, cohesive or mixed and were defined as follows: adhesive failure showed no sign of enamel fracture or remnants of composite resin on the tooth; cohesive fractures showed complete fracture of enamel or resin; and mixed samples showed both adhesive and cohesive failures. The data were analyzed using SPSS software (SPSS v21.0, SPSS Corp, Chicago, IL, USA). Descriptive statistical mean and standard deviation were used to describe the quantitative variables. One-way analysis of variance was used to compare the mean values across the five groups. Following this, Tukey’s HSD test was used for pair-wise comparison among the groups. A p-value of <0.05 was considered statistically significant. The mean shear bond strength for all experimental groups is presented in (Table 3) and shown in (Figure 1). Table 3: Mean, Standard Deviation and Standard Error of Shear Bond Strength of Bleached Enamel to resin composite (Compressive stress [Mpa]). 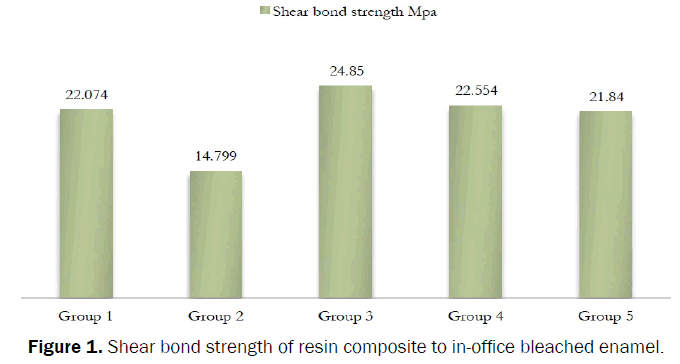 Figure 1: Shear bond strength of resin composite to in-office bleached enamel. Table 3 shows that Bleached enamel immersed in saliva for two weeksbefore bonding (Group 3) and non-bleached enamel surfaces (Group 1)showed significantly higher bond strength to composite resin than did enamelsurfaces bonded immediately after bleaching without antioxidant surfacetreatment (Group 2) (P=.000). There was no significant difference betweenbonding delayed for two weeks after bleaching (Group 3) and bondingwithout any bleaching procedure (Group 1) (P=.999). Resin composite bondedto bleached enamel surfaces treated with both antioxidants in the differentsolution forms (Group 4&5) showed significantly higher shear bond strengththan did resin composite bonded immediately after bleaching (Group 2)(P=.000). There was no significant difference between the use of sodiumascorbate solution or gel form in the shear bond strength (P=.999). The distribution of failure across the five tested groups is shown in(Table 4). From the Table, it can be noted that most of the adhesive failures inthis study were at the adhesive/resin interface. Table 4: Mode of Failure. In the current study, the bonding of the resin composite immediately after enamel bleaching showed significantly reduced bond strength compared to veneers bonded to unbleached enamel. This result has been stated in many similar previous studies [19,26,27,33,34,38-40]. The bleaching agents release free radicals as nascent oxygen and hydroxyl or peri-hydroxyl ions when they are applied to the dental structure . These free radicals may interfere with the resin infiltration into the etched enamel or inhibit the polymerization of the resin [20,25,41-44]. Changes in proteins and in the mineral content of most superficial layers of enamel after bleaching may also be responsible for the reduction in bond strength . The results of the present study showed that there were no significant differences between the shear bond strength of resin composite bonded to unbleached enamel and composite bonded two weeks after bleaching. This might be explained by the possible morphological or structural repair to bleached enamel during the time period before bonding, when the teeth were restored in artificial saliva [19,26]. Several studies found no significant difference between using an antioxidant surface treatment immediately after a home bleaching procedure and delaying the restorative bonding for at least two weeks [19,32,34,38,45,46]. This study also showed that the use of an antioxidant treatment can reverse the effect of reduced bond strength after in-office dental bleaching. The previous studies attributed their findings to the use of sodium ascorbate, which allows free-radical polymerization of the adhesive resin to proceed without premature termination by restoring the altered redox potential of the oxidized bonding substrate, thus reversing the compromised bonding . Ascorbic acid also showed effectiveness in maintaining the bond strength of the resin material not only by reducing the residual oxygen but also by etching the tooth surface . Because Vitamin C and its salts are non-toxic and are widely used in the food industry as antioxidants, it is unlikely that their intraoral use would create any adverse biological effect or clinical hazard . The specimens treated with both forms of ascorbic acid showed a high adhesive failure rate between the adhesive and the resin composite when the enamel surface was completely covered with the adhesive. This might be the result of removing the oxide layer by the ascorbic acid treatment. Sodium ascorbate is highly acidic, and it has an etching potential that may enhance the micromechanical retention of the resin. In other words, ascorbic acid is 12 effective in maintaining the bond strength of the resin material not only by reducing the residual oxygen but also by etching the tooth surface . It was observed in this study that there was no statically significant difference among the different forms of antioxidant 10% sodium ascorbate used (solution and gel). This was in agreement with Kimyai et al., who studied the effects of the two forms and concentrations of sodium ascorbate, hydrogel and solution, in reversing the reduced bond strength after home dental bleaching (10% Carbamide peroxide) . The only differences are in the flow ability and the time of application, where the gel form is more convenient in application but the solution form requires less time to work. In clinical conditions, applying the solution form is difficult because of its high flow ability and the need to apply it continuously to the tooth structure, especially if application to more than one tooth is required. The gel form of sodium ascorbate has been suggested to be more convenient for both the dentist and the patient because the patient can wear the bleaching tray, which contains the gel, and wait in the waiting area while the gel acts to reverse the compromised bond strength. However, more than 3 hours of application is considered unpleasant for the patient, and further investigation is needed to test how reductions in the application time of the sodium ascorbate gel affect its ability to reverse the compromised bond strength after bleaching. 2. The compromised bond strength after dental bleaching of enamel with 38% hydrogen peroxide was reversible after two weeks of immersion in saliva. 3. There was no significant difference between bleached enamel surfaces not treated with any antioxidant and surfaces where bonding was delayed for two weeks after bleaching. 4. There was no significant difference between the two different forms of the sodium ascorbate antioxidant used in this study. 5. Both forms of 10% sodium ascorbate (gel and solution) can reverse the reduced bond strength after in-office enamel bleaching. Special thanks to Huda S. Al Saeedi, a lecturer in the chemistry department, King Saud University, for preparing the chemical solutions used in this study. Matis BA, Cochran MA, Eckert G, Carlson TJ. The efficacy and safety of a 10% carbamide peroxide bleaching gel. Quintessence Int. 1998;29:555‐563. Haywood VB, Robinson FG. Vital tooth bleaching with Night guard vital bleaching. Curr Opin Cosmet Dent. 1997;4:45‐52. Ernst CP, Marroquin BB, Willershausen B, Zonnchen. Effects of hydrogen peroxide-containing bleaching agents on the morphology of human enamel. Quintessence Int. 1996;27:53-56. Hattab FN, Qudeimat MA,HS Al-Rimawi. Dental discoloration: an overview. J Esthet Dent. 1999;11:291‐310. Setien VJ, Roshan S, Nelson PW. Clinical management of discoloured teeth. Gen Dent. 2008;56:294‐300. Smith RG, Moran J, Addy M, Doherty F, Newcombe RG. Comparative staining invitro and plaque inhibitory properties invivo of 0.12% and 0.2% chlorhexidine mouth rinses. J Clin Periodontol. 1995;22:613-617. Sulieman M. An over view of bleaching techniques: History, chemistry, safety and legal aspects. Dent Update. 2004;31:608-610,612-614,616. Sulieman M. An overview of bleaching techniques: Night Guard Vital Bleaching and non-­‐vital bleaching. Dent Update. 2005;32:39-40,42-44,46. Kihn PW. Vital tooth whitening. Dent Clin North Am. 2007;51:319-331. Joiner A. The bleaching of teeth: are view of the literature. J Dent. 2006;34:412-419. Collins LZ, Maggio B, Liebman J, Blanck M, Lefort S, et al. Clinical evaluation of an ovel whitening gel, containing 6% hydrogen peroxide and a standard fluoride tooth paste. J Dent. 2004;32:13-17. Bowles WH and Thompson LR. Vital bleaching: the effects of heat and hydrogen peroxide on pulpal enzymes. J Endod. 1986;12:108-112. Fuss Z, Szajkis S, Tagger M. Tubular permeability to calcium hydroxide and to bleaching agents. J Endod. 1989;15:362-364. Dahl JE and Pallesen U. Tooth bleaching-a critical review of the biological aspects. Crit Rev OralBiol Med. 2003;14:292-304. Sulieman M, Addy M, Macdonald E, JS Rees. A safety study in vitro for the effects of an in office bleaching system on the integrity of enamel and dentine. J Dent. 2004;32:581-590. Haywood VB, Leech T, Heymann HO, Crumpler D, K Bruggers. Night guard vital bleaching: effects on enamel surface texture and diffusion. Quintessence Int. 1990;21:801-804. Lai SC, Mak YF, Cheung GS, Osorio R, Toledano M, et al. Reversal of compromised bonding to oxidized etched dentin. J Dent Res. 2001;80:1919-1924. Lai SC, Tay FR, Cheung GS, Mak YF, Carvalho RM, et al. Reversal of compromised bonding in bleached enamel. J Dent Res. 2002;81:477-481. Garcia -Godoy, Dodge FWW, Donohue M, O'Quinn JA. Composite resin bond strength after enamel bleaching. OperDent. 1993;18:144‐147. Cvitko E, Denehy GE, Swift E J, Pires JA. Bond strength of composite resin to enamel bleached with carbamide peroxide. J Esthet Dent. 1991;3:100-102. Miyazaki M, Sato H, Sato T, Moore BK, Platt JA, Effect of a whitening agent application on enamel bond strength of self-etching primer systems. Am J Dent. 2004;17:151‐155. Cavalli V, De Carvalho RM, M Giannini. Influence of carbamide peroxide-based bleaching agents on the bond strength of resin enamel/ dentin interfaces. Braz Oral Res. 2005;19:23-29. Sung EC, Chan SM, Mito R, Caputo AA. Effect of carbamide peroxide bleaching on the shear bond strength of composite to dental bonding agent enhanced enamel. J Prosthet Dent. 1999;82:595-599. Titley KC, Torneck CD, Smith DC, Chernecky R, Adibfar A. Scanning electron microscopy observtions on the penetration and structure of resin tags in bleached and unbleached bovine enamel. J Endod. 1991;17:72‐75. Cavalli V, Reis AF, Giannini M, Ambrosano GM. The effect of elapsed time following bleaching on enamel bond strength of resin composite. Oper Dent. 2001;26:597-602. Bulut H , Turkun M, Kaya AD. Effect of an antioxidizing agent on the shear bond strength of brackets bonded to bleached human enamel. Am J Orthod Dentofacial Orthop. 2006;129:266-272. Barbosa CM, Sasaki RT, Florio FM, Basting RT. Influence of insitu post-bleaching times on resin composites hear bond strength to enamel and dentin. Am J Dent. 2009;22:387‐392. Basting RT, Rodrigues JA, Serra MC, Pimenta LA. Shear bond strength of enamel treated with seven carbamide peroxide bleaching agents. J Esthet Restor Dent. 2004;16:250-9. Barghi N and Godwin JM. Reducing the adverse effect of bleaching on composite-enamel bond. J Esthet Dent. 1994;6:157-161. Berger SB, De Souza Carreira RP, Guiraldo RD, Lopes MB, Pavan S, et al. Can green tea be used to reverse compromised bond strength after bleaching? Eur J Oral Sci. 2013;121:377-381. Sasaki RT, Florio FM, Basting RT. Effect of 10% sodium ascorbate and 10% alpha-tocopherol in different formulations on the shear bond strength of enamel and dentin submitted to a home-use bleaching treatment. Oper Dent. 2009;34:746-752. Kimyai S and Valizadeh H. The effect of hydrogel and solution of sodium ascorbate on bond strength in bleached enamel. OperDent. 2006;31:496-9. Turkun M and Kaya AD. Effect of 10% sodium ascorbate on the shear bond strength of composite resin to bleached bovine enamel. J Oral Rehabil. 2004;31:1184-1191. Barceleiro Mde O, DeMiranda MS, Dias KR, Sekito Jr T. Shear bond strength of porcelain laminate veneer bonded with flowable composite. Oper Dent. 2003;28:423-428. Kimyai S and H Valizadeh. Comparison of the effect of hydrogel and a solution of sodium ascorbate on dentin-composite bond strength after bleaching. J Contemp Dent Pract. 2008;9:105-112. Turkun M, Celik EU, Kaya AD, Arici M. Can the hydrogel form of sodium ascorbate be used to reverse compromised bond strength after bleaching? J Adhes Dent. 2009;11:35-40. Gokce B, Comlekoglu ME, Ozpinar B, Turkun M, Kaya AD. Effect of antioxidant treatment on bond strength of a luting resin to bleached enamel. J Dent. 2008;36:780-785. Kaya AD, Turkun M, Arici M. Reversal of compromised bonding in bleached enamel using antioxidant gel. Oper Dent. 2008;33:441-447. Muraguchi K, Shigenobu S, Suzuki S, Tanaka T. Improvement of bonding to bleached bovine tooth surfaces by ascorbic acid treatment. Dent Mater J. 2007;26:875-881. Dishman MV, Covey DA, and LW Baughan. The effects of peroxide bleaching on composite to enamel bond strength. Dent Mater. 1994;10:33-36. Perdigao J, Francci, Swift Jr EJ, Ambrose WW, Lopes M. Ultra-morphological study of the interaction of dental adhesives with carbamide peroxide-bleached enamel. Am J Dent. 1998;11:291-301. Titley KC, Torneck CD, Smith DC, Adibfar A. Adhesion of composite resin to bleached and unbleached bovine enamel. J Dent Res. 1988;67:1523-1528. Murchison DF, Charlton DG, Moore BK. Carbamide peroxide bleaching: effects on enamel surface hardness and bonding. Oper Dent. 1992;17:181‐185. Kaya AD and Turkun M. Reversal of dentin bonding to bleached teeth. Oper Dent. 2003;28:825‐829. Bulut H, Kaya AD, M Turkun. Tensile bond strength of brackets after antioxidant treatment on bleached teeth. Eur J Orthod. 2005;27:466-471.